In terms of bookmakers, there has been a bit of movement in these markets recently. CloudBet and Nitro have joined the market and are offering solid bookmaker sites. The talk on the web is that both sites are competent if not the best (as to be expected from new players). 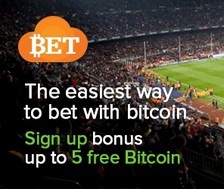 Sign up to both these BitCoin bookmakers below and start betting within minutes of your first deposit.